More trouble at school and at home — and the discovery of a missive from her late soldier sister — send Angie and a long-ago friend on an RV road trip across Ohio. Sophomore year has just begun, and Angie is miserable. Her girlfriend, KC, has moved away; her good friend, Jake, is keeping his distance; and the resident bully has ramped up an increasingly vicious and targeted campaign to humiliate her. An over-the-top statue dedication planned for her sister, who died in Iraq, is almost too much to bear, and it doesn't help that her mother has placed a symbolic empty urn on their mantel. At the ceremony, a soldier hands Angie a final letter from her sister, including a list of places she wanted the two of them to visit when she got home from the war. With her mother threatening to send Angie to a “treatment center” and the situation at school becoming violent, Angie enlists the help of her estranged childhood friend, Jamboree. Along with a few other outsiders, they pack into an RV and head across the state on the road trip Angie's sister did not live to take. It might be just what Angie needs to find a way to let her sister go, and find herself in the process. Angie is about to start sophomore year, and she's miserable. She made it through 9th grade on her second go, but her girlfriend has moved away, her best friend has been emotionally distant, the guy who has been bullying her has increased his efforts, and Angie is still trying to figure out how to mourn her sister. She is certain that she doesn't like the very public method of grieving that their mother has adopted, and it's after the ceremonial unveiling of her sister's statue that Angie finds her own way. Her sister had written one last letter to Angie, and it detailed a road trip plan for the two of them--a plan that she hoped would help Angie conquer many of her fears. FAT ANGIE: REBEL GIRL REVOLUTION by e.E. Charlton-Trujillo is a follow-up to FAT ANGIE. Unfortunately, I didn't read the first book, but that didn't stop me from being able to immerse myself in Angie's story--and her pain. Charlton-Trujillo fills in the book one backstory so that readers who are new to Angie can keep up as she moves forward, and the author manages it without interrupting the flow of her narrative too much. And that narrative ... I enjoyed it so much. The writing style for FAT ANGIE is different. There are plenty of lists, there are definitions, and there are a lot of hyphenated descriptors, and it took a couple of pages for me to adapt. Once I did, the story pulled me in and left me completely invested in Angie, her pain, and her humor. Charlton-Trujillo's approach to telling Angie's story fits perfectly with her main character's thoughts, and a lot of those thoughts are dark and angry because Angie's life is filled those things. Happily, Angie is remarkably resilient, and there's enough humor, love, and adventure to balance the pain. That said, there were plenty of sections of the book that left me reading with tears streaming down my face--be warned if, like me, you read books in public places. As Angie observes, "Life is heart and ache ... you can't have one without the other." FAT ANGIE's secondary characters, though diverse, aren't as well drawn as Angie, and we get to see them only through Angie's lens. And Angie's relationships with her friends and family are far from perfect. Her mother is unapproachable and judgmental, Angie feels that all of her friends have deserted her over the years, and Angie has trouble accepting kindnesses from people. She's seeing a therapist, but Angie is suspicious of anything that has been arranged by her mother, so she's afraid to be too invested in the therapist's suggestions. There are many great observations in FAT ANGIE, and many lessons about grieving, friendships, and self-love. But my favorite might be one that I shared with my own teen daughter: "Girls who have a story don't ever have to apologize for living it. You just gotta learn from it." 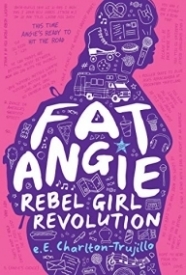 FAT ANGIE: REBEL GIRL REVOLUTION is a terrific book, and my thanks to the publisher for a copy of the book in exchange for my unbiased review.